Do the Sweetwaters blur the lines of Native American culture? By Simon Moya-SmithIt's 1 p.m., and already the temperature has swelled to 90 degrees — but the show must go on. These are tough times, says Kenny Sweetwater, the patriarch of this troupe and a member of the Southern Cheyenne and Osage tribes. Three wildfires—Waldo Canyon, which raged last summer, and the recent Black Forest and Royal Gorge fires—have kept tourists from the area. But times will be tougher this winter if the family doesn't put away some money. To do so, they'll dance in their traditional regalia for the few tourists who come by, then offer to paint their pale faces. Red, yellow, green and black geometric shapes—none of the traditional images that warriors would paint on their faces before taking on the U.S. Cavalry in those bloody nineteenth-century battles that still stain American soil. This face painting "is more modern and commercialized," says Elvira Sweetwater, who's Diné (Navajo). "It all relates to art." She charges $4 a face, and says that other Native Americans will demand $18 to do the same. "Mine's not that high. I just share it," she explains. "You know what I mean?" But academics and activists alike say they wish she wouldn't share the revered practice of face painting with non-Native Americans at all, and would stop putting on these performances so that non-Indian tourists can play cowboys and Indians outside a trading post owned by other non-Indians.I didn't know face-painting was considered "revered," but some claim it is:Theodore Van Alst, a Lakota who's director of the Native American Cultural Center at Yale University, read about the Sweetwaters' performances in an article in the Cañon City Daily Record, and they fall in a "dicey area," he says. "On the one hand, you've got to make a living," he notes. The Sweetwater family is "playing a role that is an expected one. They're playing a role created by America and the American West, in particular. They're filling a spot." Still, he explains, it's never acceptable for a Native American to paint the faces of white kids for profit. "There are certain precursory ceremonies to the painting of faces," he says. "So that's problematic. To expect some non-Native family to be able to differentiate between some random geometrics and a pattern that could be related to a particular ceremony is not an easy thing for them to grasp." Traditional Native American face-painting designs are spiritual and not strictly geometric. The designs are either familial or a representation of the individual who wears them. The face-painting portion of the Sweetwaters' show "should probably be something that they should stay away from," Van Alst says. "Eating candy and getting your face painted, that's carnival. But don't confuse Indian people with carnival." Had certain events in history not occurred—for example, had Christopher Columbus not landed here in 1492—Native Americans today wouldn't be in a position where they sell their culture just to pay a bill, he notes. "Is it entirely on them, or does the legacy of colonialism have a role to play in this?" Van Alst asks. "All of the films, the cartoons, the cultural representation of Native American people has brought us to where we are today. "Comment: So the father is Southern Cheyenne and Osage and the mother is Navajo. They perform in Cañon City, which is in Colorado. I'd say the Sweetwaters' act is problematical at best. A tipi with Kokopelli on it, a totem pole, powwow dances, and face-painting. It's sort of like the greatest hits of generic "Native culture." If the trading post sells dreamcatchers, headdresses, and toy bow-and-arrow sets, it would be just about "perfect." The headline sums it up pretty well. Not teaching Native culture, but blurring the lines of Native culture. That's not the kind of education Americans need. Elvira the mother talks about education:"The performances also educate the audience," Elvira stresses, noting that she spends countless hours teaching about Native American culture. "I work with kids," she says "I do a lot of after-school programs. I do things like beadwork, making shawls. I teach all the cultural stuff to the kids. Most are Native kids. Some are half-breeds. "Sounds good, but what exactly is she teaching them? 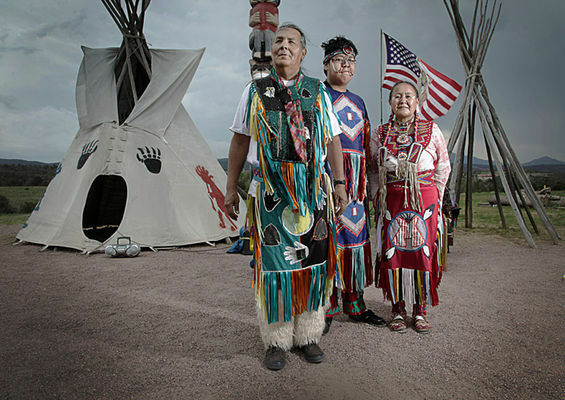 "My tribe is Navajo, and we traditionally did not have tipis, totem poles, powwow dances, or face-painting. Our performance is phony as far as the Navajo are concerned." If that's what she's teaching--that most of her act is false--then great. But wouldn't it be easier to change the act than have to explain it away. If she's not teaching that most of her act is false, that's another problem. I'm guessing she's not. For more on face-painting, see Half-Naked Drummer Dressed as Indians and "War Paint for Today's Business World."